Update 6/03/2013: The exhibit is gone, but you can check out our photos below! On July 21st we visited the Pacific Science Center in Seattle to see the exhibit, Tutankhamun: The Golden King and the Great Pharaohs. 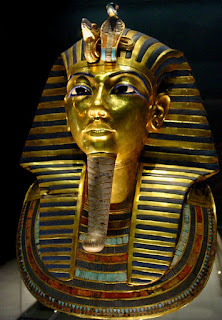 This is the last time the King Tutankhamun exhibit will be in North America, so you better go check it out before January 6, 2013 when the exhibit is over. This is an amazing, once in a lifetime exhibit! This exhibit is great for children, perhaps best for school age children and teenagers. My 11-year-old step son loved it. He is into Percy Jackson novels by Rick Riordan, so he loves Greek mythology. This was right up his alley. It was amazing coming face to face with pharaohs, or at least with their statues and golden masks. The exhibit includes over 100 artifacts from King Tut's tomb and other tombs. It includes a 10-foot tall statue of the boy king, King Tutankhamun, his canopic coffinette, which housed his stomach, and much more! Completely breath taking and worth every penny. If you are in the area, go see this exhibit! Admittance to the exhibit also includes admittance to the Pacific Science Center general exhibits. After spending time at the King Tut exhibit, we were too tired to look at the rest of the exhibits. We promised my step son we would check out the rest of the Pacific Science Center next summer. If you have never been to the Pacific Science Center, make sure you do! It is a wonderful place to take children of all ages. I'm an engineer and very into science. I remember going to the Pacific Science Center all the time as a child. It is such a hands on experience that children LOVE. The IMAX theater at the pacific science center was also playing a mummies documentary. We didn't purchase tickets to the movie. We also didn't purchase the audio commentary, which is narrated by Harrison Ford. If you purchased either the movie tickets or the audio commentary, let us know what you think in the comments section below. We tried to read every single plaque, but it became exhausting by the end of the exhibit. There is a gift shop at the end of the exhibit. We purchased the stuffed animal, CleoCATra, for my step-son. We also got him a hieroglyph puzzle set and some post cards for our collection. King Tut Exhibit at the Pacific Science Center official website - learn about the exhibit, costs, buy tickets and plan out your visit. Exhibition Content - pictures and descriptions of the treasures available for viewing. Free Curriculum Guide for teachers - you can also schedule field trips for your students. Pacific Science Center official website - find out what else is on exhibit. Tropical Butterfly House - this is a great exhibit for small children. I took my godson to this exhibit when it was at the zoo and he was 3 or 4 years old. He loved all the butterflies.